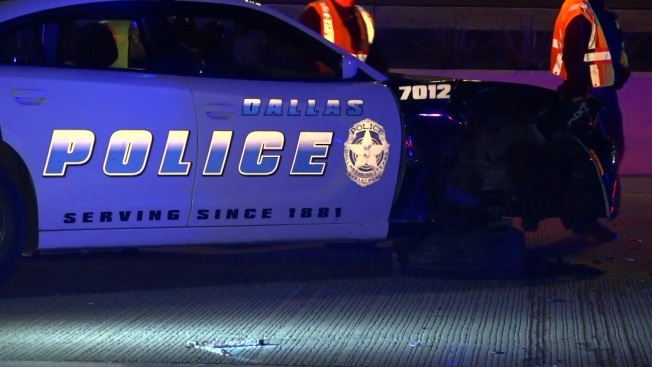 A woman is in custody after crashing into a Dallas police cruiser parked at the scene of a highway crash Wednesday morning, police say. It happened at about 1:15 a.m. in the northbound lanes of Central Expressway at the Churchill Way exit. An officer was working at the scene of a crash that had happened about an hour earlier when a Fiat 500 crashed into the front of the squad car, police said. No injuries were reported. The patrol car was empty when it was hit, police said. NBC 5's cameras captured the driver of the Fiat being questioned by police and undergoing a field sobriety test. She was later handcuffed and placed into the back of another police car. U.S. 75 was closed until about 2:37 a.m.
Police did not immediately say whether the woman will face charges.